The New Mutants arrive in Nova Roma. The New Mutants and Amara, guarded by a group of Legionnaires, arrive in the hidden Roman city of Nova Roma. Considered barbarians by the soldiers, the teenagers are locked inside a dungeon, where Amara explains that she is the daughter of the First Senator of Nova Roma, Lucius Aquilla. Roberto, concerned about his still-missing mother, doesn't trust Amara, but when he tries to smash his way out of the cell, a booby trap is triggered and all the captives are hit with darts, knocking them out. Meanwhile, at the senatorial baths, Amara's father meets with Senator Gallio and confirms that the captured males will do battle in the arena while the girls will be sold into slavery. 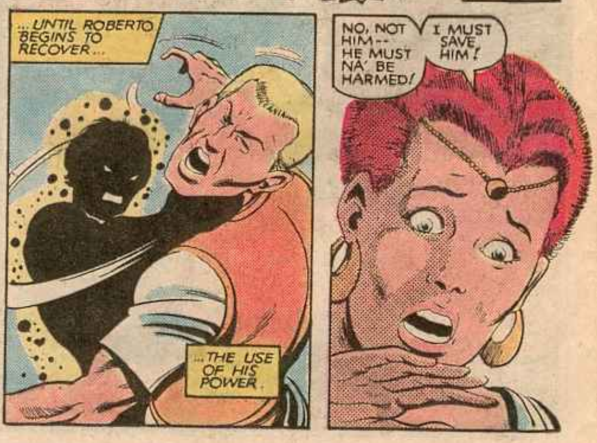 Gallio returns home to his wife, a sorceress priestess named Selene, upset that Lucius Aquilla has prevented him from using the New Mutants' to help him seize power. Selene takes him to another prisoner, the deckhand Castro. He suggests an alliance between Gallio and Emmanuel Da Costa, intriguing the senator. Elsewhere, Dani, Rahne and Amara are cleaned up in preparation for being placed in the slave auction. They're given wine which dulls their minds, though Amara manages to only drink a little. That night, Amara attempts to help Rahne and Dani escape, but they're too drugged. Suddenly, Amara is overcome by a wave of dizziness followed by the sensation of burning from the inside, the worst such attack she's ever experienced. Recovering, she's discovered by Selene. The next morning, at the arena, Sam and Roberto are given drugged wine that will increase their rage, and are commanded to fight one another. As a befuddled Rahne and Dani watch from Senator Gallio's box, the boys battle each other and an assortment of gladiators before the sight of Sam being throttled by Roberto snaps Rahne back to her senses. Transforming into a wolf, she leaps into the arena. 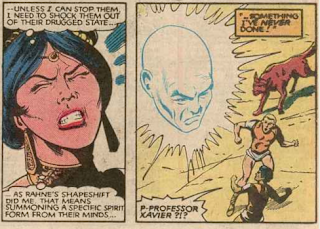 Dani, awakened through her suddenly-active rapport with wolf Rahne, creates a mental image of Professor X that stops Sam and Roberto from fighting. As the guards close in, Senator Gallio calls them off, declaring that Rahne's transformation into a wolf marks her as a descendant of the she-wolf that birthed the founders of Rome and that she and her friends are children of the gods. This is the first appearance of Selene, here presented as a Nova Roman priestess with knowledge of the black arts and married to one of the senators, yet it will quickly be revealed that she is a long-lived mutant with psionic powers and an agenda. She'll eventually join the Hellfire Club, taking up Phoenix' mantle as the Black Queen, and remains a significant X-Men villain to this day. 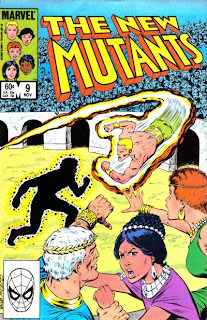 We learn Amara's full name (Amara Juliana Olivia Aquilla), and that she was sent to live among the Native Americans outside of Nova Roma to protect her from the Black Priestess and her fire cult (though she withholds this information from the New Mutants). She also experiences a physical attack, which is, unknown to her, the beginning of the manifestation of her mutant powers. To a much lesser extent, this is also the first appearance of Nova Roma, a colony of ancient Rome founded shortly after Julius Caesar's death that has remained hidden and isolated from the outside world, save for an influx of native Incans, ever since. A later story will try to retcon the origin of Nova Roma as being the result of mental manipulation by Selene on a group of contemporary British citizens, but that retcon has been largely ignored. Not that Nova Roma comes up much; significant only for being the homeland of Magma and the long-time residence of Selene, it is little more than footnote in X-Men history. Dani is able to generate a specific spirit form of her choosing, rather than someone's greatest fear/desire, for the first time. We're reminded, again, that Sunspot is strong but not invulnerable. Nova Roma is a land hidden from the outside world, thanks to its placement inside a mountainous valley, with only one tunnel through the mountains into and out of the valley, and the cloud cover of the mountains protecting it from view in the air. It's all rather dubious, at best. Rahne calls Sam "her love" and freaks out when he's in danger in the arena, which manages to clear her head of the drug she was given. The unfolding "Nova Roma" story continues, as the New Mutants reach the titular city. As you can tell from the relative brevity of this post, there's not much to this issue, mainly just a lot of setup for the remainder of the story and a token action sequence. Nova Roma is not one of Claremont's strongest ideas. 1983 is getting dangerously close to a time where the idea of hidden cities is just no longer feasible, thanks to the proliferation of, amongst other things, satellites. The Savage Land, Marvel's preeminent hidden land, is easier to buy in part because of its location (and because it was first introduced in the 1960s); but Brazil, no matter how mountainous the region, is not Antarctica. It requires a huge suspension of disbelief to accept Nova Roma, and it starts to unravel the moment you think about it too hard. To his credit, Claremont seems to quickly realize this; rather than hang onto this idea and keep returning to it until it works (or doesn't), as he does with some of his ideas, he simply plucks out Amara and Selene and, apart from an Amara-centric done-in-one later in the title's run, does little with the concept of a secret city filled with people still living like ancient Romans once this initial story is completed. Mastermind makes his play in Uncanny X-Men #175, followed by the New Mutants continued adventures in Nova Roma in New Mutants #10. Sam, Pg. 4: "What's Amara done to you?! If she isn't telling us everything, it's probably because she's scared. Ah don't think she'd lie to us." Translation: "Ah just think she's so, so purty." Bob McLeod is replaced by Tom Mandrake on finishes and the art suffers for it. Citizens of Nova Roma are descended from the Romans and Incans. Of course they speak English. I would bet good money that this is the only extant instance of a transitional caption reading "Meanwhile, in the senatorial baths..."
@Blam: Translation: "Ah just think she's so, so purty." From the trek down the Amazon to the hidden city of Nova Roma, this run of issues really feels like an old adventure serial from the 30's. Other than that, I don't have a lot to say about this particular installment. "1983 is getting dangerously close to a time where the idea of hidden cities is just no longer feasible, thanks to the proliferation of, amongst other things, satellites." I believe that is the exact reason Fabian Nicieza cited for the ret-con you mentioned earlier in the post. I have no real problem with the idea of Nova Roma; Claremont (or whoever else) could've just come up with some mystical reason why it's not visible through satellite imagery. "Claremont ... does little with the concept of a secret city filled with people still living like ancient Romans once this initial story is completed." After finishing the New Mutants Classic trades, which end (so far) with Claremont's final issue, I decided on a lark to read New Mutants Forever, which picks up right where Claremont's run ended. And guess what -- the series is subtitled "The Fall of Nova Roma", and the main plot features the New Mutants teaming up with Selene to save Nova Roma from another Marvel villain (I won't spoil it on the off chance someone plans on reading it). It seems really weird to me that after all these years of never again touching Nova Roma in his mainstream Marvel stuff, Claremont decided, somewhat randomly, to return to it for a "What If" mini-series. Because I think we were all wondering, if he hadn't left New Mutants, when he would finally revisit that mysterious hidden city! @Matt: Because I think we were all wondering, if he hadn't left New Mutants, when he would finally revisit that mysterious hidden city! Ha! I had no idea New Mutants Forever dealt with Nova Roma (I've been waiting to find an uber cheap trade to check it out) Crazy. There is the small detail of the entire Nova Roma setup being a massively racist piece of worldbuilding, which probably didn't encourage visits back, especially as a letter-writer called it out in #19. Good point. It starts with, as Blam wrly pointed out, the fact that everyone in Nova Roma speaks English and just goes from there. I'll keep an eye out for that letter when we get to issue #19 as well. Wow. Reviewing this issue of New Mutants is clearly the very button of fashion right now. The one thing I really like about this issue is that Amara's father is perfectly willing to sacrifice children in order to stop the evil Gallio, whereas Gallio for his own selfish reasons actually saves those same kids. @SpaceSquid: Reviewing this issue of New Mutants is clearly the very button of fashion right now. Amara's father is perfectly willing to sacrifice children in order to stop the evil Gallio, whereas Gallio for his own selfish reasons actually saves those same kids. Great point. Gallio is clearly poised as the villain, yet he's the one who stops the guards from killing the New Mutants at the end. Uh, yeah, I have to agree Fabian Nicieza on that one. The Nova Roma idea was just too ludicrous to sustain plausibility. Hell, I partially hoped that Cassandra Nova's Sentinels would take a quick detour to the Amazon after they got done with Genosha. @Jonathan: I have to agree Fabian Nicieza on that one. The Nova Roma idea was just too ludicrous to sustain plausibility. The only contention I have with Nicieza's outlook is that as ludicrous as Nova Roma is, it would have been better to just ignore it and never mention it than pile on by adding the whole "they're actually modern Brits led to believe all the Nova Roma nonsense".